Arriving first at the finish line means to win a race, but just being at the start line means that you are already a champion, even more when we are talking about the Dakar: the world's hardest off-road race. This picture by Franck Fife of Carlos Sainz after breaking his Peugeot says it all. 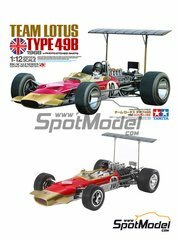 A new reedition of this Tamiya classic scale model, now featuring photoetched parts. Available for a short time and in very few units. 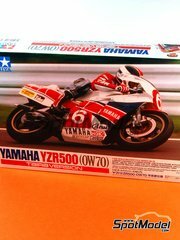 A time limited reedition of the bike that made Tadahiko Taira champion. 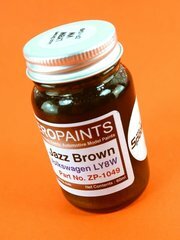 The metallic brown tone used by Porsche, Audi and Volkswagen in their sport and street cars for many years. 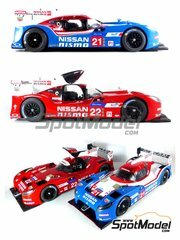 An unique scale model kit of the car that raced at Le Mans 2015, after a 16 years absence of Nissan at Spa. 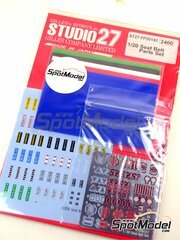 Featuring decals for three different number pads, as well as the possibility of an open assembly (doors). 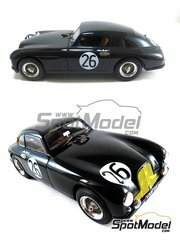 Resin scale model kit of the car racing at Le Mans 1951. 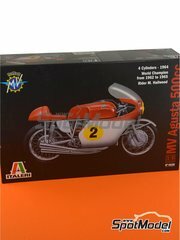 Included inside the box are the dashboard and street version seats, but it does NOT include the figurine. 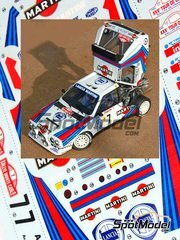 A new reedition of the mind blowing kit by Profil24 of the gorgeous Lancia Delta S4. Just a few units will be manufactured!! . 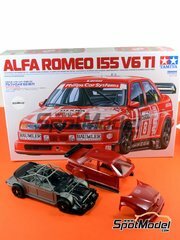 A new reedition of the classic Tamiya scale model about the gorgeous 1993 championship winner Alfa Romeo 155 V6 TI. The kit also features a completely broke up and detailed engine. 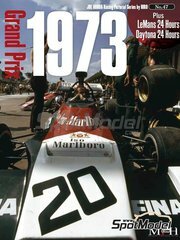 The book features pictures taken at Brazilian Grand Prix, Spain Grand Prix, Monaco Grand Prix, Sweden Grand Prix, Dutch Grand Prix, Le Mans 24 Hours and Daytona 24 Hours in 108 pages translated to both English and Japanese. 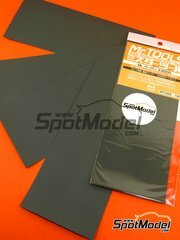 Set of polyesther cloths in 1000, 2000 and 3000 grit. Perfect for both wet and dry use, and you can use it both to polish glossy paint, as well as lacquers, barnish, and even crystal and transparent plastic parts. 2000 Grit fine grain water sand paper, developed for sanding without any harm plastics, resins and white metal. 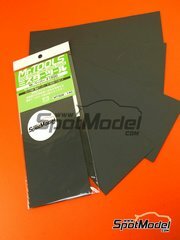 1500 Grit fine grain water sand paper, developed for sanding without any harm plastics, resins and white metal. 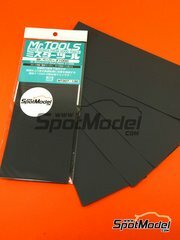 1000 Grit fine grain water sand paper, developed for sanding without any harm plastics, resins and white metal. 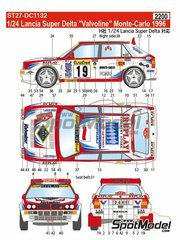 Spare decals set for using on Tameo Lotus 79 racing at Italian Grand Prix 1979 sponsored by Essex. 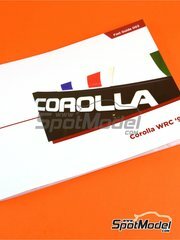 This issue from the Fast Guides series comes fully loaded of photographs of the Toyota Corolla WRC. 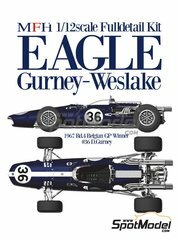 The book is A5 size, featuring 34 full colour pages with photographs of the actual car, digitally enhanced to bring up even the smallest details and conveniently sorted for quick reference. 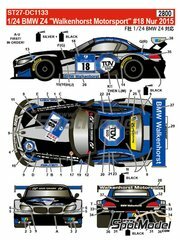 Definitely a very interesting guide for knowing the interior, carbon fibre panels, bottom side and many more parts of the vehicle with full details. 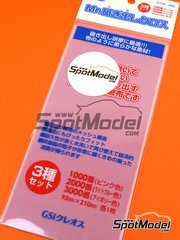 Tamiya went a big step ahead creating this masking tape, in 5mm width and 20 meters long, that will be really handy when masking straight and/or curved areas in your scale models. 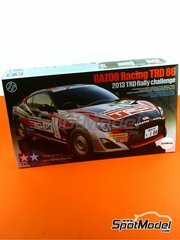 As awesome as always, here's the new Tamiya scale model of one of the modern racing icons: the Toyota Gazoo. 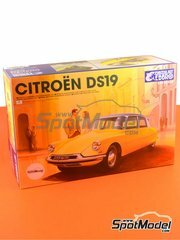 Kit features a detailed engine, full break-up of transmission and shock absorbing systems, masks for painting window frames... ¡¡and an endless number of parts that will make you enjoy it for hours!! 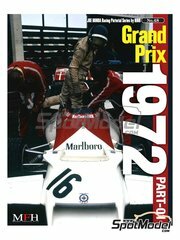 This issue feature pictures of the following 1972 GPs: French Grand Prix, Monaco Grand Prix, Belgium Grand Prix, Germany Grand Prix, Austria Grand Prix, Canadian Grand Prix and North America Grand Prix, all along the 108 pages included. 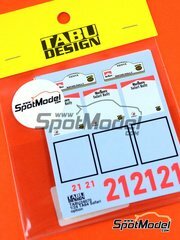 Tamiya went a big step ahead creating this masking tape, in 2mm width and 20 meters long, that will be really handy when masking straight and/or curved areas in your scale models. Tamiya went a big step ahead creating this masking tape, in 3mm width and 20 meters long, that will be really handy when masking straight and/or curved areas in your scale models. Modern Formula 1 are mostly built from carbon fiber parts, and McLaren has always pioneered their use: the MP4/30 is a good example of that. 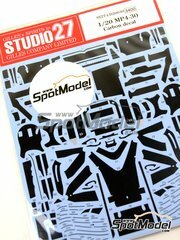 With the two decal sheets from this set you could finally give your model the looks of the actual car. Light blue, dark blue and aluminium, an impressive color combination without any doubts for the even more impressive MP4-12C racing the Italian GTs Championship in 2015. Italy printed decals by Cartograf using traditional screen and offset printing techniques for achieving mind-blowing color effects and transitions in these spectacular decals of the Nurburgring 24 Hours winning car. 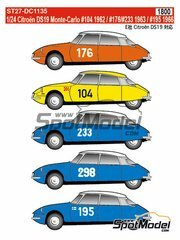 The DS19 faced numerous rallies, one of them being the Safari Rally that you can now recreate with these decals by Studio27. Studio27 mind blowing Formula 1 seatbelts are now back in their catalogue! These belts can be used with both modern and classic cars, and the set also includes photoetched parts, decals with logos of the main seatbelt manufacturers, seatbelt fabric in assorted colors, and white metal parts. 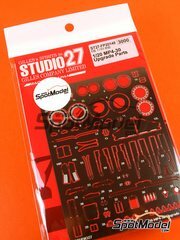 Their awesome racing seatbelts are finally back in Studio27 catalogue!!! These belts can be mounted with either 4 o 6 anchor points. 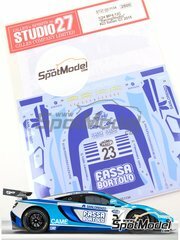 The set also includes photoetched parts, decals with all main seatbelt manufacturers logos, different colored fabric material, and white metal parts. 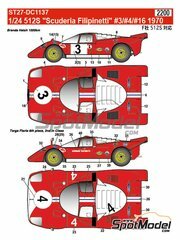 Three decorations for the incredible 512S. 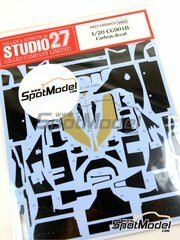 Do you want to build 3 kits to make the most out of these decals? 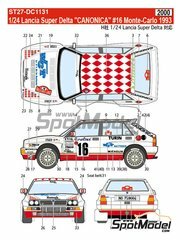 The decals for the diamond looking decoration worn by the Lancia Super Delta Deltona HF Integrale at 1993 Montecarlo Rally. 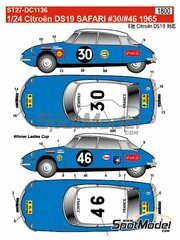 Incredible decals set with nearly all number pads that raced at Montecarlo during the lat 50's and the 60's. 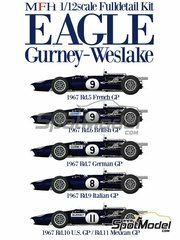 Do you like classic race cars? 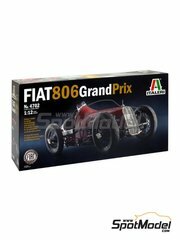 Do you love BIG scale models? Then search no more, this is your kit. Once built, your kit will measure nothing less than 30cm. 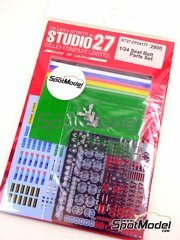 Includes a huge pile of plastic parts, rubber parts, metallic nuts and bolts, springs and one gazillion of details. 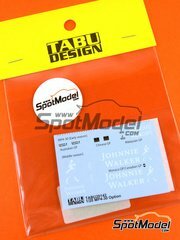 Add the Johnie Walker sponsor decals to your censored MP4/30 scale model. 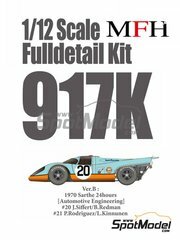 Additional decals for Aoshima scale model kit including the Marlboro sponsor and number pads in the same fluo tones. Set of photoetched parts for detailing the MP4/30, also including seat belt fabrics and a white metal part for the harness buckle. 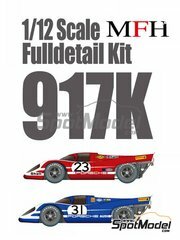 Your scale model is crying out loud for it!!. Finally, here's the Valvoline sponsored Lancia Delta at the 1996 Montecarlo Rally. Two splendid sheets with all carbon fiber and kevlar patterns for bringing your Leyton House back to life. 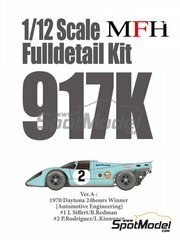 This fantastic kit won the best vehicle scale model kit award at Nuremberg Toy Fair 2016, and it does deserve it: superb parts break up, excellent quality, meticulous detailing, and the possibility to chose from either an open or closed assembly... as you please!